Dr. Hector Rodriguez earned his medical degree at University Autonomous of Guadalajara, and served his residency at SUNY Buffalo Affiliated Hospitals, Buffalo, New York. He went on to complete a Fellowship in Head and Neck Surgery at Montefiore Medical Center and Albert Einstein College of Medicine. He served as the Director of Rhinology at Columbia University Medical Center. Dr. Rodriguez specializes in treatment of snoring and sleep apnea, sinus surgery, laser surgery, and nasal physiological function studies in patients with sinonasal pathology. He is entering private practice after completing an impressive 22-year tenure in Academic medicine at Columbia University. Dr. Rodriguez has had vast experience, having treated over 120,000 patients and is an expert in the field of Rhinology and Snoring. He was the first to introduce Endoscopic Sinus surgery and LASER surgery for snoring at Columbia University. Dr. Rodriguez has pioneered innovative treatments utilizing Radiofrequency ablation in patients with chronic rhinitis. Currently he utilizes advanced surgical techniques in the treatment of patients with sinusitis including Balloon Sinuplasty combined with "Fusion" navigational Systems. 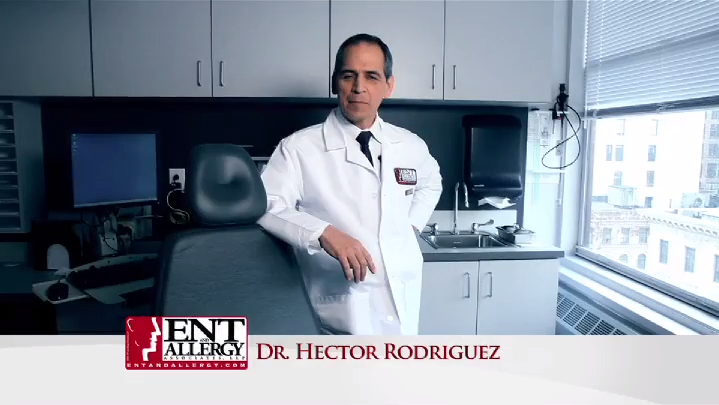 Dr. Rodriguez began seeing patients at ENT and Allergy at our West Side Manhattan office on July 1, 2012. My co-worker just asked for an ENT and I made sure to recommend Dr. Rodriguez. He is tech forward, his staff is both helpful and knowledgeable. As far as the wait times, the two times I've been I was seen within 15 minutes of my appointment. I have been seeing Doctor Hector Rodriguez for the past 2 years for my ears problems. He treats me very professional and he does a fantastic professional cleaning in my ears. I only come to him because I trust his hands and he has clean my ears many times. He is a great Doctor I truly recommend him if you have ear wax problems or sleep apnea problems. He specialize in many other Otolaryngology areas. I will continue to be his loyal patient and I truly Thank him for caring for me. He was fast but also perceptive and no-nonsense. Along with all the other staff at ENT and Allergy, Dr. Rodriguez is friendly and professional as well as competant. Would recommend. Dr. Rodriguez is truly great. His staff messed up the spelling of my last name in the paperwork and charged my copay to someone else. The misspelling caused a ton of problems with the insurance and the pharmacy. He was very kind and extremely informative. I have no hesitation in going back. Dr. Hector Rodriguez is amazing!! As an ENT physician and as a person. As a medical professional myself I know a gifted doctor when I encounter one. This doctor is incredible!! A nice doctor however the waiting is horrible!!!! Very professional and friendly, I would recommend him. Very professional and thorough. Got straight to the point. Was in and out in less than an hour. Dr. Rodriguez was exceptional as well as his assistant Olga. I am always able to get an appointment with him at times that are convenient for me. He is thorough with his examination and explains things so that I can understand him. Thank you! He is friendly and very knowledgeable. Contacted me twice the next day to check my progress and help with some side effects from medication. Rita P.
I had a very pleasant experience with Dr.Rodriguez and his staff. I had a septoplasty a month ago perfomed by Dr. Rodriguez. Authorization from my insurance was received within a week, thanks to his staff efforts, and scheduled only one week after authorization in Mount Sinai hosp. Everything went very well, Dr. Was extremely reassuring, I felt comfortable and calm- I new, I was in good hands. Follow ups revealed a good recovery. I couldn't appreciate more Dr. Rodriguez's professionalism and personal approach,not to mention that his stuff is amazing. I would definitely recommend Dr. Rodriguez to anybody who needs ENT doctor's help. I received excellent attentive care and expertise and I would highly recommend him! I have been a patient of Dr. Rodriguez for many years and he is superb. Wonderful bedside manner, calm, compassionate. He moved recently to a nicer space on UWS outside of the main Columbia medical center. Though the receptionist staff there are a little unsophisticated, it does not matter. The ancillary clinical staff are just fine and the space is far more clean and newer. If you want to see a thoughful ENT with decades of experience affiliated consistently with the best academic programs in the city, he is your guy. Great doctor, knowledgable, professional, patient.The staff is very friendly and helpful, the doctor is always on time and very responsive to patients' needs and complaints. Bravo, Dr. Rodriguez!